Gigi Hadid was spotted leaving her New York apartment wearing a RtA Marvin Hoodie ($348.00), Re/Done Patchwork Skinny Jeans ($168.00), a Holzweiler Shearling Denim Jacket (Not available online), ’47 Brand New York Rangers Hat ($20.00), her Prada Etiquette Bag ($2,216.00) and Reebok Club C 85 Zip Sneaker ($49.97). 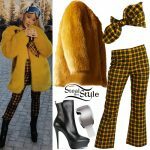 Madison Beer celebrates her 19th birthday Mr. Chow wearing the Meshki Ruby Diamante Strap Mini Dress ($70.00), RtA Gustave Shawl Collar Coat (Sold Out), a Luv Aj Pave Mini Cross Hoop Earring ($185.00 pair) and Dr. Martens Jadon Platform Boots ($170.00). Demi Lovato performed at New York City Center on Wednesday wearing a Contrast Stiching Bustier Top ($710.00) and matching Waistband Cutout Trousers ($1,294.00) by David Koma, a cropped RtA Sequined Sleeve Denim Jacket ($766.00), Djula Diamond Hoop Earrings ($8,243.75) and Steve Madden Wagner Ankle Boots ($77.40). Cindy Kimberly posted a picture on instagram a couple of days ago wearing a RtA Gothic-Embroidered Cashmere Sweater ($695.00), Balmain High Rise Skinny Leather Pants (€1969.67), Saint Laurent SL 181 Loulou Sunglasses ($420.00), and Balenciaga Ceinture Cut-Out Ankle Boots ($1,275.00). Lucy Hale was spotted leaving her birthday dinner at Viva Hollywood wearing a Fleur Du Mal Luxe Triangle Bra ($98.00), a Derek Lam 10 Crosby Deep V-Neck Longsleeved Blouse ($158.00), the RtA Ivy Skirt ($695.00), Chanel Calfskin Leather Coco Boy Flap Bag Shoulder Handbag ($4,195.00 – preowned), Alaia Lace-Up Leather Sandals (Sold Out). You can find similar sandals for less at JustFab ($59.95). Amanda Steele posted a picture on instagram a couple of days ago wearing a Danielle Guizio DG Oversized Hooded Crop Sweatshirt ($150.00), RtA Leather Flare Pants ($696.50), vintage checkered sunglasses (Not available online), a Ryedecker Debbie Belt ($45.00) and Vans Old Skool Core Classic Sneakers ($60.00).